Clay Drink: Add 1 heaped teaspoon to a glass of water, juice or your favourite smoothie. Lightly stir and it is ready to drink. Premixed Clay Drink : Mix 1 part clay to 10 parts water. eg.100g of clay to 1 litre of water. 1 serve = 50 ml. Dilute with water or juice as required. Shake well before use. Edible Paste: 1 part clay to 2 parts water. eg 20g clay to 40ml water. For best results let it hydrate for a couple of hours, the longer the better. No mixing is necessary, just let it sit. Any excess water can be poured off. Tip: Sprinkle the clay into the water. Not the water to the clay. When making a large amount sprinkle it in layers ie. water first then clay then water etc. It will hydrate more evenly. 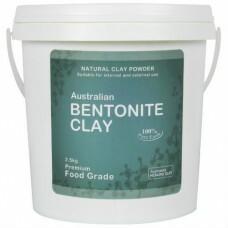 Store the hydrated clay in a sealed container of food grade plastic or glass only. Refrigerate when premixed for ingestion.